Sparkling bubbles and inspiration from a classic summer cocktail make this an iced tea an instant favorite. 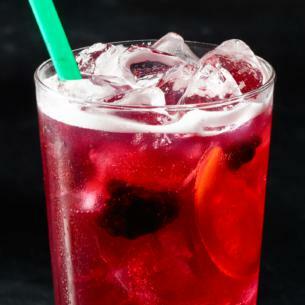 Freshly brewed Teavana® Iced Passion Tango™ Tea and apple juice are hand shaken with a medley of juicy berry flavors then accented with real blackberries and orange slices.The delicious result is a finish that's both sweet and tart. Ice, Apple Juice, An Infusion Of [Water, Hibiscus Flowers, Citric Acid, Natural Flavors, Cinnamon, Apple, Licorice Root, Lemongrass, Fruit Juice Extract], Sangria Syrup [Water, Sugar, Raspberry Juice Concentrate, Elderberry Juice Concentrate, Peach Juice Concentrate, Blood Orange Juice Concentrate, Natural Flavor, Potassium Sorbate, Citric Acid, Potassium Citrate], Freeze-dried Blackberries, Freeze-dried Orange Slices.